#22 – Tides of Time – What's Eric Playing? November 15, 2015 November 22, 2016 • What's Eric Playing? Let’s go with an odd game for this post. 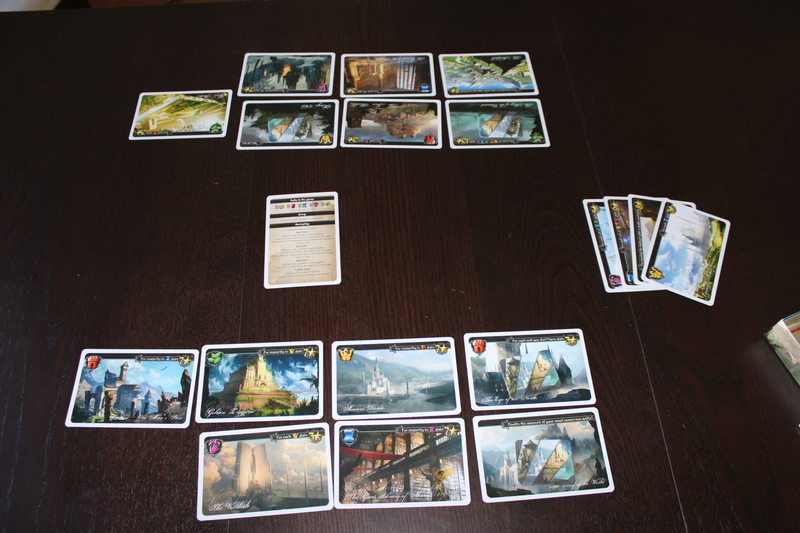 Tides of Time is a two-player only micro card game. Yep, you read that correctly. You can only play it with two players. It’s part of a growing set of sort of “duel” games, which are pretty handy when you’ve only got one other person around or you’re trying to get a short game in while you’re waiting for other people to show up. This game in particular tasks both players with building the superior civilization, however complications arise that may leave you with a scattered mess rather than a cohesive empire. There are 18 cards in Tides of Time and 4 cardboardish tokens called Relics from the Past (Relics). There’s also a scorepad and a neat little pencil, which is kind of a nice touch. Shuffle the cards and deal each player five cards and give them two Relic tokens. Congratulations! That’s literally the entirety of the setup. Not hard. and three cards without suits. There are three cards for every suit, as you might surmise, and they each have conditions that cause them to be scored (or contribute to other cards being scored). These can vary from 3 points per card of a certain suit to 9 points for having certain combinations of suits to 7 points for having the most of one suit to even things like scoring 8 points if you score the highest with a single card. Some of the nonscoring cards will double the number of your most numerous suits or let you win all ties (for the majority cards). There’s a reference in the rulebook, and you should probably read it over before you play so that you don’t get blindsided by unexpected cards. Since the round is over, score your cards and record this round’s score for both players. At this point, you should take one of the Relics tokens and pull the five cards back into your hand. 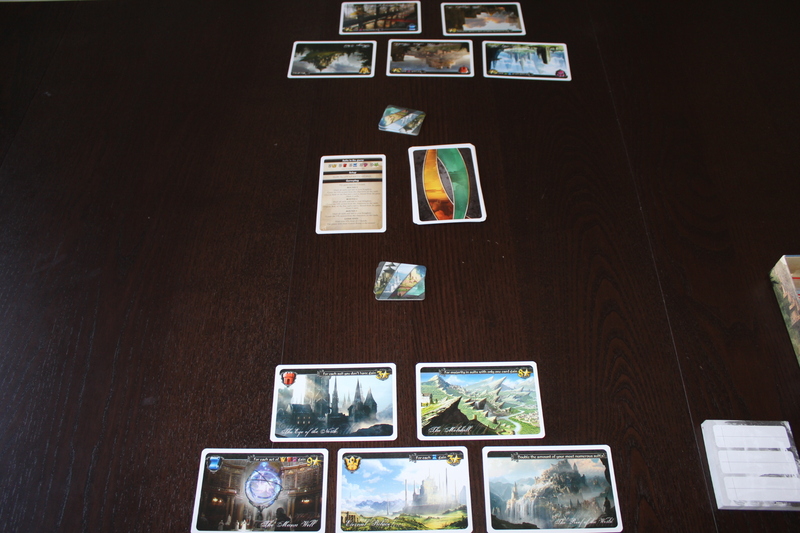 The Relic token lets you save a card and put it in your Kingdom for the rest of the game. This allows you to build up some strategy. Pick a card you’d like to use your Relic token on and place it face-down with the token on top of it. 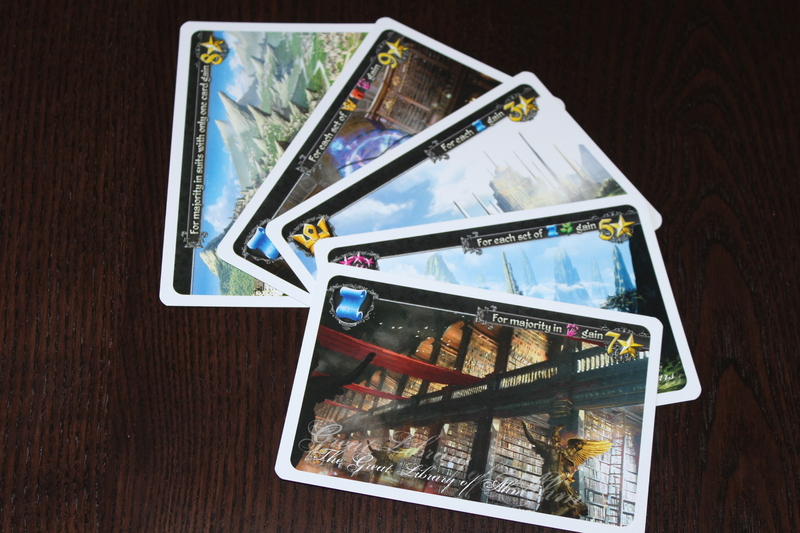 Then, choose another card from your hand to remove from the game altogether. You should now have only three cards in your hand, so draw two more and then start Round 2. After finishing Round 2, do the same thing (spend a Relic token on one of the five cards in your hand and remove another one from the game). 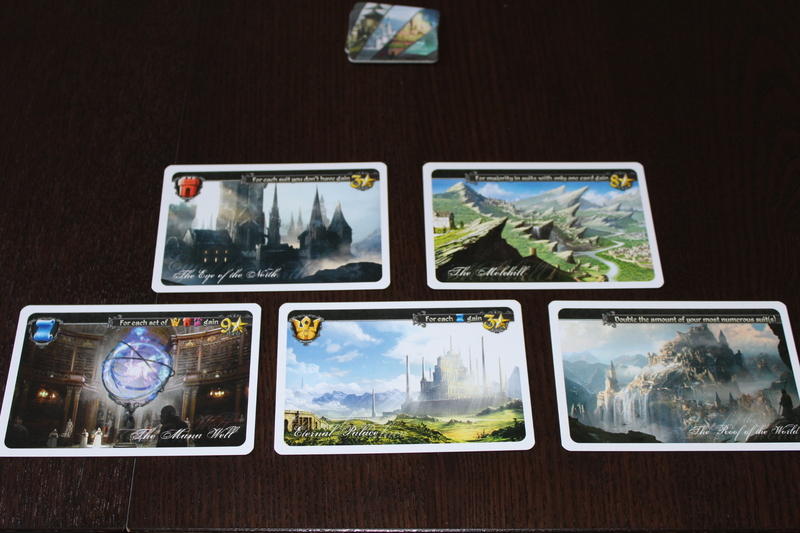 You should have two cards with two Relic tokens in your Kingdom, then draw two more cards and start Round 3. After Round 3, the game ends. Tally your total score, and the person with the most points, wins! Hooray! That’s about all there is to say on Gameplay. Like I said, it’s only 18 cards, so there aren’t a TON of different ways the game can go, especially with only two players. This is where it can get a bit odd, especially due to card interactions. Make sure you’re paying attention to how cards interact. You don’t want to take cards that give you bonuses for scrolls if there are no scrolls in your Kingdom. That’s just kind of obvious, sure. But, you also want to watch out for cards that, say, give you a bonus for only having one card of a suit and cards that double your most numerous suit. Suddenly, you have two of every card and score nothing. Denying your opponent cards they need is as important as getting cards you need. The nice thing about two player games is that preventing the other player from scoring is essentially as good as scoring, yourself. If a player relies heavily on a card that needs crowns, towers, and hands, it may be good to continually remove one suit from the game. This prevents your opponent from getting a lot of points. It’s not always good to rely on one card to score points. There is a card that gives you 13 points for every set of all five suits you have, but as soon as you play it your opponent will likely try to prevent you from getting at least one suit, in which case you can’t score it. Using your Relic tokens well is the key to success. Like denying your opponent cards, keeping the right cards for yourself between rounds will help you significantly long-term. For instance, saving the “13 points for every complete set” card will set you up to potentially score it in both Rounds 2 and 3, if you’re able to complete it. The “Win all ties” card is pretty useful, most of the time. Since there are a number of cards that give you points for beating your opponent in some metric (number of cards of one suit, number of suits with one card, most points scored with a single card), the card that allows you to win every tie is pretty clutch, even though it doesn’t score you any points. Honestly, a lot of the game’s strategy depends on your initial hand, as some cards reward depth and some reward breadth. Just try not to mix cards from each camp or you’ll be left scoring nearly nothing. The art for this game is pretty awesome. It’s just very rich and lush and nice. Short. I have a noted preference for short games, and this one doesn’t disappoint. Cheap. It is what it is. Easy to learn. Generally speaking, the gameplay is easy to learn. If you’re looking to build a strategy, however, this takes a lot longer. Good introduction to drafting games. It’s very simple and straightforward, as mentioned previously. Filled a gap in my collection. I tend to play one-on-one with one of my housemates pretty frequently (or just am in a lot of “two player” scenarios) and having a small, light, two-player-only game augments my collection pretty well. You really need to know what every available card is. Just because you see a card that gives you 9 points for having one of three certain suits doesn’t mean there are cards for every conceivable combination of suits. This can lead to some unfortunate expectations from players. Trying to learn what every available card is can take a lot of time. You need to sort of scour the rulebook first or look at all the cards, and even then you won’t really be able to build up a strategy until you know all the cards well. I feel like the replay value isn’t going to hold up, long-term. I currently think it’s a pretty great little game for what it is, but I worry that after a certain point the only real replay value will be that the cards are randomly dealt, so we don’t always get the same cards in the same ages. You can get totally hosed. If you choose poorly, you will spend the rest of the game scoring virtually nothing. This is usually a great way to irritate your co-player. Furthermore, if one player gets ridiculously ahead in Rounds 1 or 2, there may not be a way to catch up. This can be a pretty large bummer. Overall, this is a neat little game and isn’t as strategy-heavy as my other two-player game, RESISTOR_, but I don’t think it stands up to some of my current favorite two-player games (Carcassonne, Dominion, Roll for the Galaxy). And that’s okay! It doesn’t have to. This is a nice way to scratch a quick drafting itch or just a good thing to carry on me if I don’t want to lug the Dominion Big Box around every time I want to play cards (it’s pretty large, hence the name). I think it’s pretty fun and I enjoy it, but like I said, I’m worried that won’t be true for long as I get used to all the cards. I think this game could do very well with an expansion; especially one that requires you to leave some cards out of the game altogether. That way, you wouldn’t see every card every game, which I think would greatly assuage my concerns about replay value. Posted in reviewTagged board game, board games, card game, card games, competitive, competitive game, drafting, drafting game, duel game, duel games, portal games, tabletopBookmark the permalink. Two player board/card games have always fascinated me because I feel like they contradict one of the biggest facets of games, the social aspect. But at the same time, a lot of them are loads of fun and can be used in any number of different situations. Cool review, I will definitely have to look into Tides of Time!